Some families vacation in the mountains, some visit Florida’s Disneyworld, but Roger J. Muller, Jr. of Hoboken, New Jersey, Professional Divemaster and Assistant Instructor who holds 80 PADI, NAUI, TDI, SDI and SSI certifications decided to give his daughters Kelsey, 19, and Taylor, 15, a trip to remember. Muller took his daughters, who are also certified divers, aboard the Nautilus Explorer to Ensenada, Mexico’s Guadalupe Island where they plunged 40 feet below the water’s surface to observe the behavior of the mysterious Great White Sharks. Muller chose the Nautilus Explorer, which takes small groups of scuba divers on unique diving expeditions to give his daughters a memorable vacation away from the daily demands of their busy lifestyles. Muller, a Certified Professional Insurance Agent oversees Muller Insurance, the family business, in Hoboken, and in his spare time serves as General Manager and Captain of the Hoboken Rockets Ice Hockey team; Kelsey is a sophomore studying economics at Harvard College in Cambridge and Taylor is a high school sophomore. Based in British Columbia, Canada, the Nautilus Explorer takes divers to the giant mantas and dolphins of Socorro Island and adventures into Alaska, British Columbia, the Sea of Cortez, the California Channel Islands, Baja California, San Benitos Island and Clipperton Atoll. Guadalupe Island is the top destination for Great White Shark encounters, says Jason Crabb, Director of Marketing for the Nautilus Explorer, and the best way to observe Great White Sharks is by descending into their world and interacting with them on their terms in a natural way. With four submersible aluminum cages that descend to 20-foot and 40-foot depths, the Nautilus Explorer takes divers down to where the sharks naturally travel and without chum to attract them the encounters between humans and sharks are an equal exchange of curiosity and respect. That’s exactly the experience Kelsey and Taylor shared with their dad, who taught them how to dive in 2001, while training for his PADI Assistant Instructor certification. Muller trained his daughters to become certified divers in the family’s backyard pool. Muller says his daughters’ training and his experience as a diver made it easy for him to take them on the Great White Shark diving expedition. During their trip, Kelsey and her dad were together in one of the submersible cages with Kelsey shooting video and Muller, who is also a PADI Digital Photography Instructor, taking photographs. At one point Muller stuck his head out between the bars of the cage just as a Great White Shark passed by – his head just inches from the shark’s mouth, which startled but didn’t surprise Kelsey one bit. Of course, it all turned out alright; the Great White Shark kept on passing through and both Muller and Kelsey have photos and video footage of the experience. From the moment she entered the submersible cages that plunged 40 feet below the water’s surface Taylor says she was filled with excitement. She has gone on many diving adventures with her dad and sister, but this experience was over the top. Nautilus Explorer makes 18 trips per season, from the end of July to the middle of November, which is the season of the sharks’ migration to Guadalupe Island’s warmer waters to feed on the massive Sea Lion colony that lives there. They also go there to mate. Very little is known about the mating rituals of the Great White Shark. There’s still a large mystery looming over these species and the Nautilus Explorer regularly takes groups of scientists to Guadalupe Island to unravel those mysteries. The Nautilus Explorer’s aim is to raise awareness of the beauty and peacefulness of Great White Sharks and to remove the fear factor typically associated with the mention of their name. Captain Mike Lever of the Nautilus Explorer and his wife Mary Anne established the Guadalupe Conservation Fund and work closely with the Mexican Navy and the Mexican Environmental Agency CONANP to help ongoing research on Great White Sharks as well as to observe and report illegal shark fishing off Guadalupe Island. The owners of the Nautilus Explorer went as far as buying a twin engine aircraft which they donate the use of to the Mexican Park service. 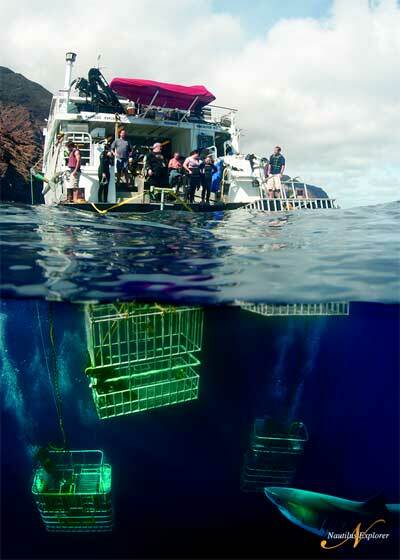 Shark conservationist and activist Alisa Schwartz recently returned from her third trip to Guadalupe Island. She was 11 when she began diving with her dad, a former Navy Seal, and since then she has gone on to work with Shark Angels, a non-profit advocacy group based in New York and 333 Productions, a documentary film company in Exeter, Rhode Island, which recently won an award from the Cousteau family for a 90-second film they made for Jacques Cousteau’s 100th birthday. Educating children about the importance of sharks and the survival of our oceans is critical, Schwartz says. Kelsey and Taylor say they had a thrilling time diving with the Great White Sharks and for both girls, it is an event they will remember the rest of their lives – although it’s very likely the girls and their dad will be taking more exciting diving trips in the future. Sally Deering is an arts and culture writer. She resides in Weehawken, New Jersey. I totally agree that just because you have a certification in a certain type of diving it does not make you a good diver. I have found the more you do a certain type of diving the easier it gets. Experience and knowledge are real important. Jose, Lee and Brett, thanks for you great comments. I just saw them and today just got interviewed by PADI for an article in the Undersea Journal. I am not up to 107 different certifications and have 86 with PADI. NAUI I did the Divemaster and Assistant Instructor. My daughters are now 19 and 24 and just finished the Dive Master , Assistant Instructor and EFR Instructor courses in Bali. They are proving they know how to dive and teach for sure now! 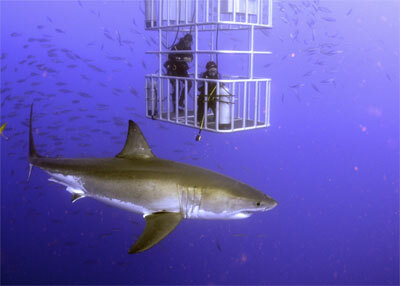 Diving with the Great Whites was a great experience for the whole family! Thanks again. According to the author, they did have several TDI and SDI certs so those need to be added to the list as well. Maybe they’ll break 200 certs now between the three. Of course, my point is that experience and actual competence should be the “measuring sticks” not the absurd number of ratings that tend to become irrelevant in this sort of discussion. Think of all the clothing bills you could save with outerwear from just the patches alone. ROFL! This is what diving is about! My daughter earned her certification at age 12, and we dove the shipwrecks at Isle Royale together. She worked on liveaboards on Lake Superior through college. She married a guy that used to manage a local dive store. Gave us two grand-daughters who for the life of me, I could not get interested in diving. Frustrated, I finally gave them all scuba classes as a Christmas present. I took the entire family to Yap and Palau and now I have a three generation diving family.I will have them take on Lake Superior this coming summer and I’m loving it! Let me get this straight… dad has 80 diving certifications. One daughter, all of 19, has 38 diving certifications. 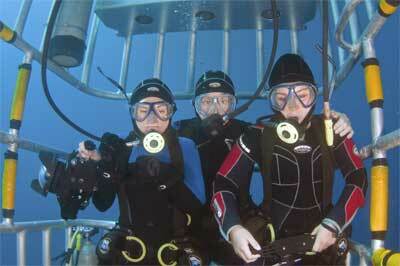 The other daughter became a certified PADI Master Diver… at age 12. I’m glad they had a great family outing with the sharks. I hope they picked up their PADI Shark Diver Specialty while engaged in this activity. I’d just like to see their windbreakers with all these patches sewed on them. Might be the most egregious examples of “emblemism” in diving history.